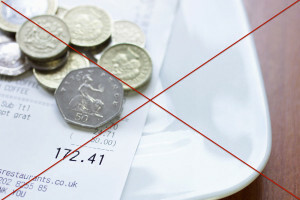 The furore in the press over service charges has served to highlight the mess that the tipping system creates in the UK. But it’s a shame that we have been the only ones to raise the really big question – why do we submit ourselves to this agony in the first place? Brits hate tipping – we’re embarassed about it. We’re not like our colonial cousins over the Pond who love the chance to lavish largesse on those who snap to, and to snub those who need to learn their lesson. We’re much more like the French and the Italians, who just want to pay up and get home. In fact, even some American restaurateurs are toying with the idea of introducing a no tipping policy to manage rising labour costs, according to The New York Times. One US restaurant group Ivar’s has ended tipping and raised prices by 21% in order to pay staff higher wages. This is in response to the first stage of a $15-an-hour minimum wage law, which took effect in April. Of course, one of the reasons we have to put up with the service charge is tax. Because restaurants aren’t taxed on “optional” tips, the industry have no financial interest in grabbing the nettle. But there’s no huge revenue uplift in it for HMRC either, so it’s hard to get anyone too excited about change. And organisations like the British Hospitality Association (BHA) have larger fish to fry, like calling for lower VAT on eating out. So it’s not a priority for them either. This leaves the poor old British consumer embarassedly trying to calculate the correct amount to leave, or – worse – having to challenge the waiter who brings along the credit card machine where service has already been added to ensure they are not being ripped off in being invited to add another amount on top of what’s already been levied. It’s time to agigate. It’s time to make some noise. It’s time to call for the end of this embarassing and outdated form of self-inflicted misery, and to make service charge a compulsory component of the bill, as it is already “en continent”. â€¢ It’s a classic example of British masochism – we all hate it, but we all put up with it. Why? â€¢ No-one in Europe does it this way. If closer ties with Europe means ditching tipping, vote EU tomorrow. â€¢ It encourages confusing and offputting practices like “optional” charges that are no such thing in reality, and dodgy dealing by some establishments aiming to double their money. Should tipping be abolished in the UK?